Baby cereal is a common first food for little ones. There are a ton of baby cereals available on the market today, and some are better than others. Although rice cereal is a low-allergenic food, studies are surfacing about high levels of arsenic being found in rice cereal. Rice naturally has arsenic in it and can be harmful to people, especially babies during their developing years. So, it’s becoming more common to feed babies cereals sources from other grains like oatmeal, wheat, barley, and quinoa. Oatmeal is another great low-allergenic grain, so it is becoming a new staple in baby cereals. Here are some of the best cereals, organic and non-organic, available on the market today! “Say hi to a happier belly.” Happy Family is an innovative baby food company that aims to bring optimal nutrition to babies and their families. Happy Family is a mom-owned company that partners with pediatricians, dieticians, and other children’s health expert to make informed decisions about their recipes for healthy baby food. The perfect choice for baby’s first solid food, Happy Baby Organic Probiotic Cereal is optimized with probiotics to support digestive health and fortified with Iron & Choline to support baby’s development. Choline is a great nutrient for your little one’s brain development. Along with essential vitamins and minerals, probiotics such as lactobacillus acidophilus, bifidobacterium lactis, lactobacillus salvarius, lactobacillus plantarum, fructooligosaccharides are packed into this nutritious cereal. Parents also state that their babies love the taste of this cereal, making it a win-win for all parties! 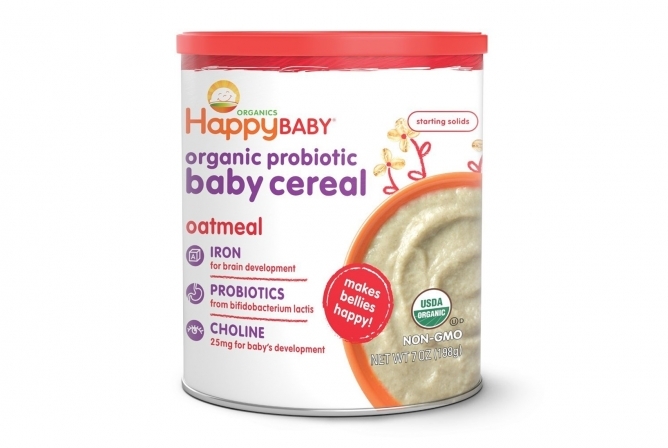 Happy Baby Cereal MSRP is $0.50/oz, but check the current Happy Baby Organic Probiotic Baby Cereal – Amazon price. To learn more about the Best Organic Baby Foods, Click Here. Earth’s Best produces a fine line of baby foods and cereals with clean ingredients and whole grains. All ingredients are certified organic and don’t contain harmful chemicals or pesticides and as well as no added salt, modified starches or refined sugars. Another nice thing is the extremely short ingredient list, ensuring there aren’t a bunch of crazy ingredients (sometimes the shorter the better). Because of the high-quality ingredients, the taste of Earth’s Best Baby Cereals stands out above competitors. Babies literally gobble this cereal up, and for good reason! Earth’s Best also has some fun flavor options: Multi-Grain, Oatmeal, Rice Cereal, Mixed Grain Cereal with Apple and Sweet Potato, and Oatmeal Cereal with Bananas. Pure ingredients result in purely good flavor, making a purely great experience for your baby. Good ingredients also make it easier on baby’s tummy. Additives and artificial ingredients can wreak havoc on their little digestive systems. Earth’s Best makes it a point to add pure ingredients to their cereals. Our little ones (and their sensitive tummies) will appreciate us for choosing pure and healthy ingredients for them. 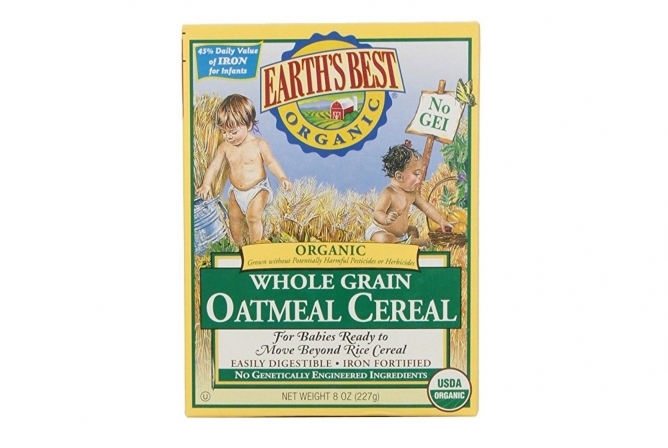 The MSRP for Earth’s Best Oatmeal is $1.05/oz, click here to find the current Earth’s Best Organic Oatmeal Baby Cereal – Amazon price. To learn more about the Best Organic Baby Foods, Click Here. Read the full review for Earth’s Best Baby Food. What makes some grains easier to digest than others lies within the structure of the grain. When the grain is a “whole grain”, this means the entire grain is intact, the bran, germ, and endosperm which all contain protein and great nutrients. However, this can be difficult for some babies to digest (and what causes wheat allergies for some people). Beech-Nut separates the bran and the germ from the grain ultimately leaving an easier-to-digest grain for sensitive tummies or those more prone to allergies. 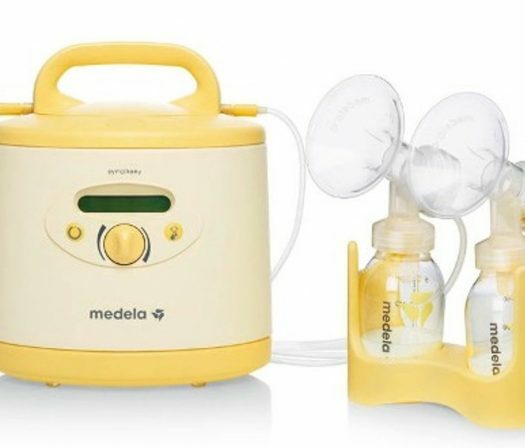 This does leave the grain more processed, but some babies really need an alternative when they have problems digesting whole grains. There are no flavor differences with this oatmeal, however, and babies seem to like it as much as other baby cereals. One other great aspect about Beech-Nut cereals is that they come in easy-to-go pouches great for traveling and a quick snack. Not many other baby brands have that availability! 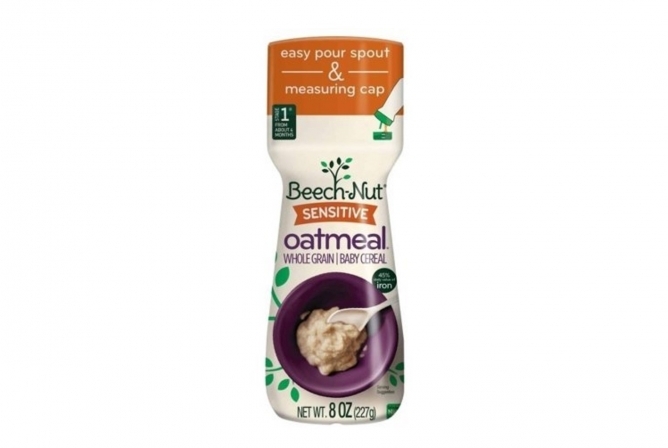 MSRP for Beech-Nut Single Grain Oatmeal is $1.05/oz but check out the Beech-Nut Single Grain Oatmeal Baby Cereal – Amazon price right now. If you want to learn more about Beech-Nut Baby Food, Click Here. Wutsup Baby? This cute baby food company’s mission is to make high-quality on-the-go meals and snacks for parents with infants and toddlers. They offer a line of quinoa-based cereals that you can seriously feel good about giving your baby. Quinoa (pronounced keen-wah) is a high-protein, nutrient-dense grain that is considered a superfood and is also hypoallergenic and gluten-free (one of the only truly safe gluten-free baby cereals you can find). Quinoa also naturally contains omega 3, 6, and 9 fatty acids that are essential for brain and eye development. The natural fiber in quinoa can also act as a prebiotic to help aid your baby’s digestion and won’t cause constipation as easily as other processed baby cereals. Also, there aren’t ANY added ingredients other than the actual quinoa that makes the cereal. Quinoa has enough iron and important nutrients that it doesn’t need to be fortified with other artificial, man-made vitamins or minerals. 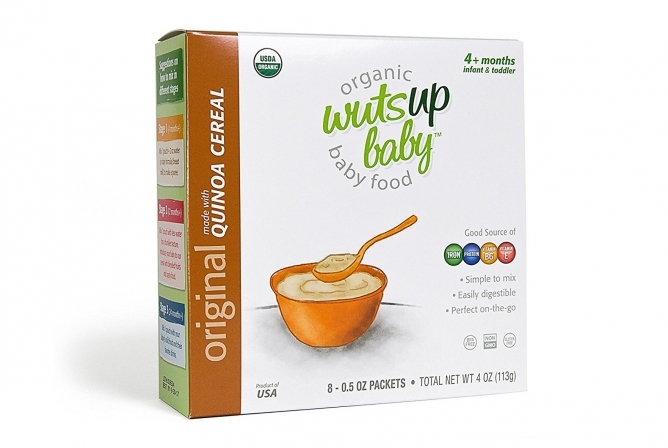 Wutsup Baby also offers some yummy flavor options for their cereals: Quinoa Carrot, Quinoa Cherry, and Quinoa Apple and Banana cereals. All cereals are gluten-free, certified organic, kosher, non-GMO, hypoallergenic, and don’t contain artificial colors, preservatives, flavors, or sugar and are made in the USA. PURELY GOOD ingredients for your baby! The MSRP is $2/oz (10.97 for a 8-packet box) but check the Wutsup Baby Quinoa Baby Cereal – Amazon price here. To learn more about the Best Organic Baby Foods, Click Here. Gerber is a classic household baby brand, and they’ve been putting nutritious baby food on the market since 1928. Years have only made this baby food company stronger; Gerber baby food can be found almost anywhere and has tons of exciting flavors. Gerber Oatmeal Baby Cereal is a top seller for families everywhere and it’s great on the wallet. The lower price doesn’t mean quality is lacking, however. This cereal is non-GMO, has no artificial colors or flavors, and is packaged in BPA containers. It contains fortified iron and other nutrients, but other than those specs doesn’t have any frills or other high points. There are tons of fun flavors and options offered, like rice, multigrain, barley, and oatmeal with fruits added in such as bananas and apples. There is an organic line of Gerber Baby Cereals, and there are also fun flavors with “Lil’ Bits” of fruit added. Gerber offers a nice variety and is a strong and trusted baby cereal brand. 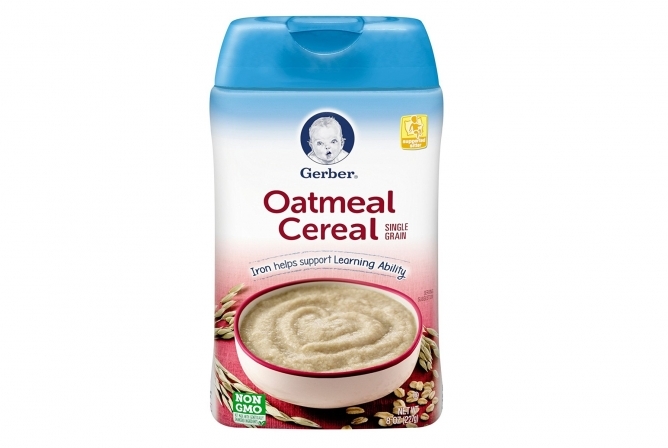 With an MSRP of $0.40/oz, check the Gerber Oatmeal Baby Cereal – Amazon price here. In the end, many baby cereals contain very similar ingredients, so don’t put too much pressure on yourself to choose “the perfect baby cereal”. Every baby is different and will tolerate every food differently, so keep trying new things until something is a hit! Organic is always a great option (click here to see our Best Organic Baby Foods post), but sometimes the price isn’t doable for everyone. In the end, there isn’t a “wrong” choice when it comes to baby cereal. They all have great features and will help make your baby grow into a healthy little cutie!